The other night I lay in bed worrying about all of the out-of-control aspects of my life. My recent move to South Carolina, current unemployment, houseboat in need of repairs, and car problems have pushed my shoulders to a permanent position slightly below my ears and caused the left side of my jaw to clench. As a nurse, I know that stress can cause stomach problems, insomnia, elevated blood pressure, and chest pain. Lately, I’ve had them all. My daughter restricts me to only worrying about three problems each day, but even the process of choosing three problems to focus on leads to palpitations and emotional paralysis. Is it any wonder I find it hard to sit down and write? Any surprise that after three weeks my clothes remain in a suitcase rather than hung up in my closet? I think not. I’m embarrassed to admit (but some of you won’t be surprised to hear) that some of my anxiety is irrational. It’s one thing to be stressed about finding a plumber to replace a hot water heater on a houseboat, another to worry that poisonous insects will squirm up through the air conditioning vents and crawl into your ears while you sleep. Right? It’s normal to worry you’ll encounter a loose dog while walking your dogs and have to break up a dog fight, slightly crazy to think a black snake (googling a picture will haunt my dreams so I imagine an eight foot long snake as thick as my arm) will be lying in wait on the side of the road and attack me. My daughter tells me it must be hard to live in a world where I’m always waiting for the worst to happen. It is. Pharmaceuticals aren’t helping nor is alcohol. I could try meditation, but worry some creature will scurry over me while I’m lying prone. In my mind, my South Carolina lakeside home is as dangerous as the Florida Everglades at night. That sums up my skewed thought processes. In desperation, I’m trying a new strategy to deal with my stress. 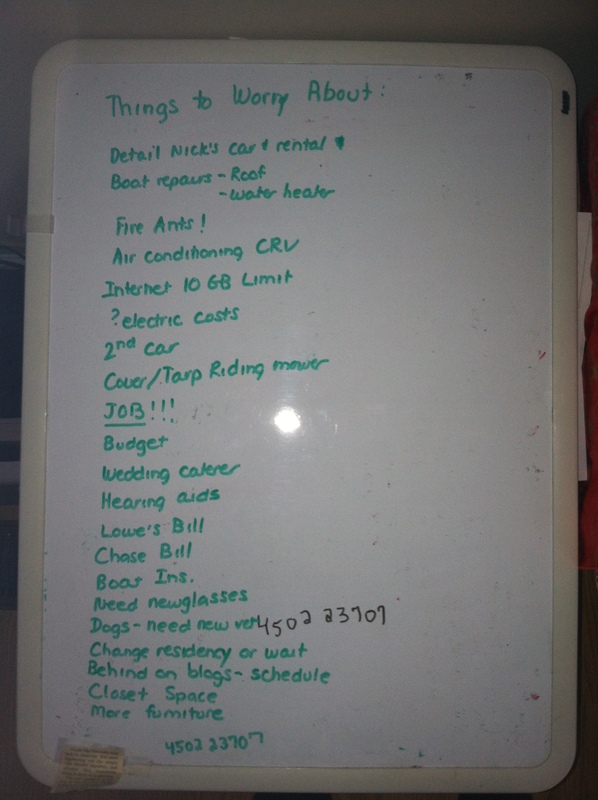 Instead of agonizing over it, I write it down on a white board titled “things to worry about.” My list covers everything from a caterer to fire ants. It’s a grand conglomeration of every single thing I can think to worry about, no matter how insignificant or psycho it seems. It guarantees, unless someone sneaks into my house and erases it, that I don’t have to keep all of my worries at the forefront of my thoughts. Instead they are readily available and easily added on to. Things to worry about. Must add snakes. This entry was posted in healthcare, relationships.